St. Louis-based Perficient, a digital consulting firm, has acquired Boston-based Stone Temple Consulting, which focuses on search engine marketing, research and services. Stone Temple CEO Eric Enge plans to remain with the company as the general manager of the new Perficient business group within the Perficient Digital agency, adding about $9 million in annual revenue. Perficient generated revenue of about $485 million in 2017. Bill Davis, vice president of marketing and communications at Perficient, told Search Marketing Daily the publicly traded company, prior to the announcement, projected revenue in 2018 between $485 million and $510 million. 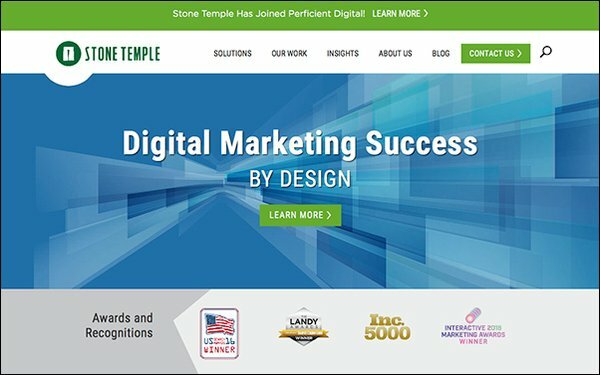 “Stone Temple Consulting is a well-run business that brings great talent, an impressive client roster, compelling cross-sell opportunities, and a strong reputation within the search and digital marketing ecosystem,” Davis wrote in an email to Search Marketing Daily. Along with an impressive client base, Perficient acquires Stone Temple’s SEO and content marketing tools, which it will use to build out services. In addition, the buy will deepen its digital marketing portfolio of services, which includes analytics, paid search, search conversion, marketing automation and enterprise digital strategy. In time, the brand will shift to Perficient, Enge said. Services shouldn’t change, as it's a strong cultural fit, he said. Enge also said the company will continuing publishing reports and insights based on search.